One ancillary goal of my quick weekend trip to London involved trying as many new airline products as possible. Given that my final leg took me from Boston to DFW, jetBlue made for a natural choice. Believe it or not, I’d never previously flown jetBlue. Of course, as someone based in DFW, that’s not hard. After all, they offer just two nonstop flights a day, both to Boston. With a one-way fare of just $151.10 for jetBlue Economy Class, this presented the perfect opportunity to knock one more airline off my list. NOTE: in case you’re wondering, yes, I wanted to try Mint, but jetBlue does not offer it on this route. Doing so would have involved flying to SFO or LA first, then backtracking to DFW. Tempting, but I didn’t have time. In any event, jetBlue’s coach receives plenty of hype on its own, and I looked forward to trying it. When I fly domestically, I check bags so rarely that I hardly ever think about needing to do so. While checking in online the night before, though, I realized I needed to on this flight. The reason: I’d picked up a bottle each of perfume and scotch, neither of which passes TSA muster. Which was a bummer, because it meant an extra $20 bag fee, since I have no status with jetBlue. (NOTE: jetBlue offers a $5 discount on the first bag when paid in advance online.) Anyway, when I printed my boarding pass at the kiosk, it didn’t note my pre-paid bag. I asked an agent, who told me the agent at bag drop should be able to see it. Sure enough, the agent accepted my bag with no issues. Just be aware, if you pay in advance, it may not print on your boarding pass. Anyway, after a painless PreCheck, I spent some time in The Lounge at BOS, but headed over to the gate area early to check things out. I must say, jetBlue does a fantastic job with its gate space. Yes, you can sit in ordinary airport chairs. But there’s also a wide selection of stylish, comfortable seating if you crave something different. The setup is reminiscent of a lounge, with chairs in groups of 2-4 with a drink table. In addition, there are several dining-style booths, if you’d like a restaurant experience with your takeaway burger bag. If you need to work, the space contains several work benches, with a two-outlet plug per two seats. Even when sitting in the plain-old airport seats, jetBlue provides power outlets at each two seats, plus two USB ports. Color me impressed. jetBlue provides as close to a lounge atmosphere as you can get in a public gate area. Southwest has tried to improve the passenger experience in its gate areas, especially at Love Field, but clearly could still take some lessons from its smaller brother. Anyway, boarding began a couple of minutes early, and was quite an orderly process. Ironically, we boarded a “jetBlue Loves NY” livery plane, in Boston, headed for Dallas. Most jetBlue aircraft feature only a single class of service, Economy Class. jetBlue Economy Class features a standard 3-3 configuration with 150 seats. However, on these older A320 aircraft, the seats contain a generous 34 inches of pitch. That beats even Southwest by a good inch, and the difference is noticeable. If 34 inches doesn’t cut it for you, the first 5 rows and the exit rows are “Even More Space” seats. Choosing these seats incurs a fee, but the reward? An incredible 38-39 inches of pitch, almost comparable to domestic First on legacy carriers. As a point of reference, seat pitch on American’s newer A321s in First measures 38 inches. Note, however, that 34 inch pitch applies ONLY to the older A320s. jetBlue’s newer A321s feature 32-33 inches in regular Economy, and 37-41 inches in Even More Space. Though the leather seats are roomy, the upholstery is clearly showing its age. jetBlue really should spruce these up. In addition, I’d imagine the lack of headrests would be uncomfortable for sleeping. Though a little beat up, the seats were fairly comfortable. I’ve consistently found the seats on newer A320 family aircraft uncomfortable, mainly because the slimlines provide poor thigh support. These older seats, however, feature much better padding, and made for a comfortable 4-hour ride. 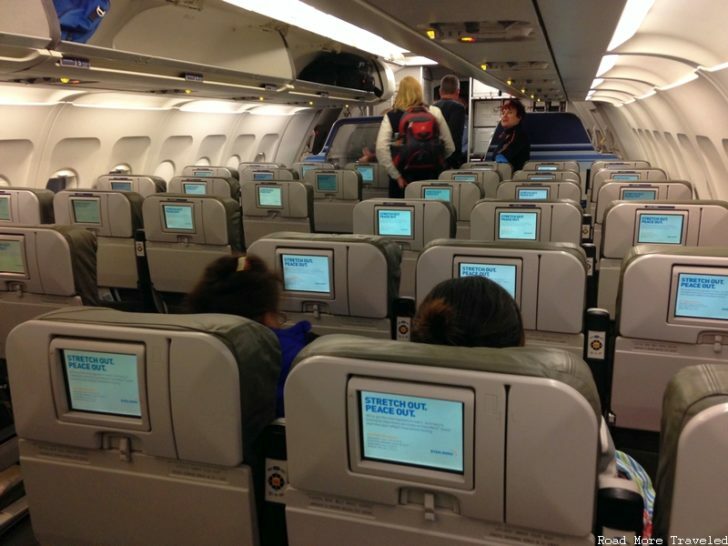 Each jetBlue economy class seat includes personal televisions. Though the screen is a tad small, picture quality is decent. In addition, I much prefer the “in-seat” setup, versus monitors that swing out from the armrest. But the best part of the jetBlue economy class experience? Free WiFi! That’s right, jetBlue’s FlyFi is free for all passengers. Not only is it free, it’s actually reasonably fast. Although slightly slower than my home broadband, I had no trouble catching up on Instagram cat videos. In addition to web surfing, Amazon Prime customers can connect to Prime Video. For those who don’t wish to sign up for the free trial, jetBlue also offers “The Hub”, which advertises a variety of streaming content. I didn’t try to connect to it, thus, can’t comment on the selection. There is. however, one significant negative on these A320s – no power ports, outside of Even More Space. This becomes an issue on a 4-hour flight, as my laptop started running out of gas towards the end. Fortunately, you won’t encounter this problem on the A321s, which include ports throughout the cabin. About 20 minutes after take-off, the flight attendants began their service. Given the lousy food selection in The Lounge, I hadn’t eaten much before the flight. Though jetBlue provides basic snacks for free, they also offer snack boxes for sale for $7. More substantial meals appear on transcon and some international flights. The “PickMeUp” box (basically a cheese plate) caught my eye, so I ordered it. The friendly FA also suggested an upsell – a mini-bottle of wine, and a 15% discount on both items. How could I say no to that? The bill after discounts came out to $11.90, which is more than I’d typically pay for boxed cheese and airplane wine. While the cheese was alright, it’s unusual to find French wine on a domestic flight. Louis Mondeville chardonnay is a fair wine – too floral, but a decent pairing with cheese. It retails for about $27 a bottle, so the normal price of $7 is reasonable. That makes the discounted price of $5.95 a good value. As for service, both FAs servicing the cabin were friendly and efficient. More importantly, they showed a knack for service recovery. I had an issue when I ordered my meal, in that the wine didn’t arrive with the cheese box. The FA said her colleague would deliver it with beverages in a few moments. But no wine was forthcoming as he passed our row. Eventually, after waiting about 20 minutes, I pushed the call button to check on it. The FA who took my order was quite apologetic, and promptly brought it to me. I appreciate that mistakes happen, but it’s the recovery that counts. Our flight started off with a sleek jetBlue E-190 at the gate next door. Then, following an early pushback, we passed an Aer Lingus A330 757 as we taxied towards the runway. A subliminal message for ANA to fly to Boston, perhaps? As we approached the taxiway, we passed the cargo terminal, with the Boston skyline creating a perfect backdrop to this FedEx freighter. Shortly thereafter, a fully unblocked view of the Boston skyline across the harbor. After take-off, we first passed by a suburban area to the northeast of the airport. A few moments later, we made a U-turn, making a fly-by of the BOS airfield to the south. And then finally, a fine view of the Boston skyline from above. I ended up engrossing myself in TV and Instagram for much of the flight, and anyway, the sky clouded over after about an hour. As we began our descent over southwest Arkansas, we encountered a bit of stormy weather. A bit of chop aside, the rain clouds at sunset made for a gorgeous view. Finally, poking through the clouds on final approach to DFW revealed an ugly evening across the Metroplex. Thanks to light headwinds, our flight made it to the gate about 25 minutes early. Which turned out to be a very, very good thing, because a nasty storm parked itself over the north end of the airport just as my Uber was taking me home about 20 minutes later. We’d have been delayed for sure if our flight was on time. Anyway, my one checked bag made it to the carousel in about 10 minutes. That’s great for DFW, which usually suffers from very long baggage wait times. I came away from this flight highly impressed. Though the interiors could use some sprucing up, everything else about this flight was excellent by domestic standards. Crews were good, the seats were roomy and comfortable, and the buy-on-board food, though pricey, was at least imaginative. Even the gate areas are superior to anything else I’ve found at US airports. jetBlue definitely deserves its accolades, and this flight was a fantastic value for the price. I just wish they had more options out of DFW.